If you’re a comic book geek, then it’s a safe bet that you’ve heard of Kamikaze. 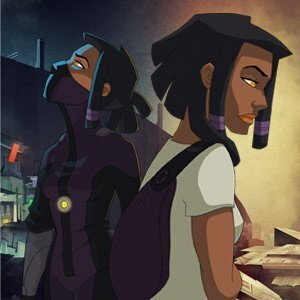 One of the hottest webcomics online, Kamikaze is the futuristic saga that revolves around Markesha Nin, a young courier who wants a better life for herself and her father but finds herself in the middle of a vast and deadly conspiracy. Consisting of Carrie Tupper, her husband Alan, and Havana Nguyen, #TeamKamikaze continues to garner momentum and fans. Through a recently fully funded Kickstarter campaign the Atlanta-based team has released a hardcover of volume one of the popular series. 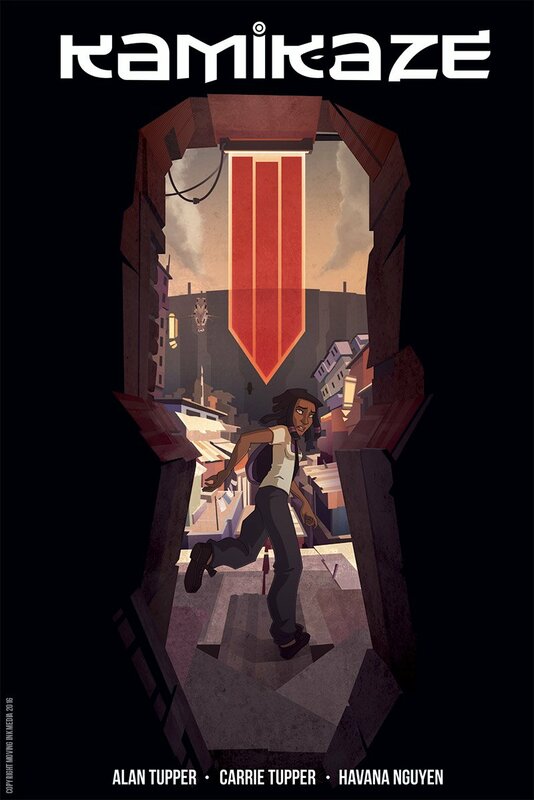 Last year the popular series won the Glyph Comics Award for best webcomic. 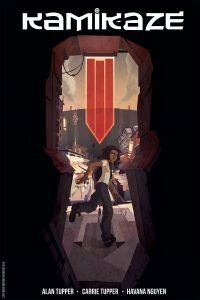 I sat down with the trio to discuss the world of Kamikaze, infusing much needed diversity into speculative fiction with a black heroine, and the success of the popular series. Upkins: Carrie, Alan, Havana, thank you for taking time out of your schedules for this interview. For the unfamiliar, why don’t we do a round of introductions. Alan: My name is Alan Tupper. 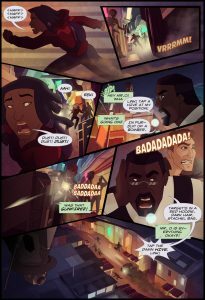 I’m one of the co-creators of Kamikaze, and I focus on the layout and background art for the comic. When I’m not working on Kamikaze, I’m a freelance artist who works primarily in the animation and game industries. I’m a transplant to Atlanta; I moved from Maine over a decade ago to study art. Carrie: I’m Carrie Tupper, the lucky girl that got to marry and create with Alan! I’m a co-creator on Kamikaze, serving as the comics lead writer, ink and paint artist, project coordinator and artistic director for every page we release. I studied animation, and while I love the medium we didn’t have the best relationship. Then comics came in and I’m so much happier for it! My path isn’t one I’d suggest anyone else going down, but I’m here now and I’m loving it. 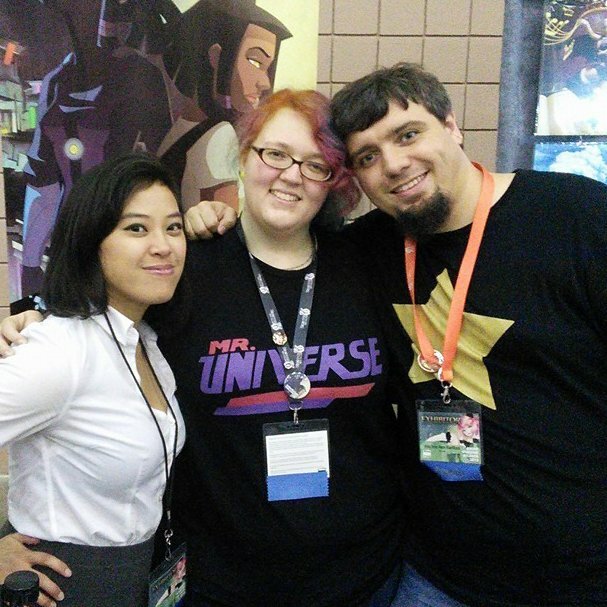 Havana: I’m Havana, Lead Character Designer and Character Artist on the project. I also do the graphic design and lettering. Upkins: Havana, Carrie Alan and I graduated from the same art school. Why don’t you share your art background. Havana: Hah, I am the only one out of the trio without an art degree. I actually got my degree in International Affairs and work in technology but I’ve been drawing since I was 3. I have a lifelong love affair with animation and comics. Upkins: Havana, how did you connect with Alan and Carrie? Havana: I was connected with them via Michael Harper, a very talented writer and director who was helping them polish the property at the time. Shortly after I graduated, I joined the team and the three of us hit it off. Because I did not go to art school, it was really cool and inspiring to be around other animation nerds. We immediately bonded over our belief that animation can be a storytelling medium for both kids and adults. That common outlook has motivated us throughout the project. Upkins: Let’s go back. How did Team Kamikaze come about? What inspired this endeavor? Alan: Initially, Kamikaze started off as an idea for an animated series that Carrie and I would throw back and forth. We both love animation and believe it has a lot of untapped potential for storytelling beyond the general audience market it’s traditionally served in the West. 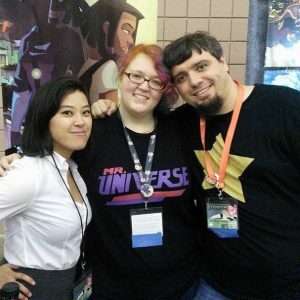 The story grew out of a desire to create something with the emotional and topical range you can find in some Anime, along with a gradual awakening of a lot of social issues we were going through. It slowly evolved as a fun side project over the coarse of several years, and it wasn’t until about the last four years or so that we started taking it seriously. We were really spurred into action by a filmmaker friend who introduced us to Havana and helped mentor us through the process of crafting a quality professional pitch. After pitching the project to some big outlets and getting a positive but timid response, we shifted over to producing the webcomic as a way of proving that there was in fact a demand for the show. Carrie: Kamikaze came around on a summer night back in 2005. Alan and I were working on a homework assignment for college and he drew this really amazing character that caught our attention. There was just something about this chick that said, “Tell my story!” And so this little bug buzzed around in our brains for a really long time. Fast forward several years and I’m working as a set photographer for a director friend of mine, Michael Harper. When we do the hand off of the photos, I ask if he’d be willing to hear a pitch, just to see if it had any potential. He agreed to listen and I dove into it. By the time that meeting was over Michael told me, “If you two don’t do something with this, I WILL.” That was all the encouragement we needed really! Michael introduced us to Havana, and then from there we just kept going. Inspiration wise, the entire idea was originally centered around the struggles of what it’s like to go to college, but as it’s grown, I think it’s a lot more about the struggles younger generations face in a world that can feel like it’s given up on them. When you become and adult at 18 no one really tells you that you’re still growing up, and that even as an adult you never really stop growing up. Ultimately I think the center of Kamikaze is a coming of age story about someone who has every right to be a villain, but becomes a hero instead! Upkins: Share with us the premise of Kamikaze? Carrie: Kamikaze is a story set 200 years after a planet wide pandemic that wiped out most of the plant life on earth. The whole world has turned brown and the last patches of viable cropland are heavily guarded by feudal corporate states. Our main character, Markesha Nin only wants one thing: to find a better life for herself and her father. Hell bent on escaping the only home she’s ever known for a better place, she takes a risky job that blows up in her face. Caught in a deadly trap with nowhere to turn, her only chance at finding a better life could ensnare her in a dangerous game she may never escape.